Windows 8.1, the first major update to Windows 8, is available to download now in a free preview version now, Microsoft CEO Steve Ballmer announced during the Microsoft Build 2013 keynote. 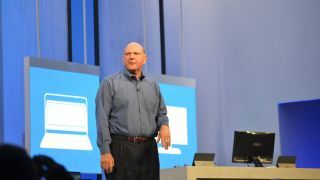 Ballmer took the stage to greet viewers and audience members at the keynote kick-off to Build 2013 with a casual, friendly speech. He announced that Microsoft's Visual Studio 2013 is also available to download now. It turns out the rumors about Windows 8.1 were true; the update "blends the desktop and the modern experience," Ballmer said, and includes the return of the start button and a boot-to-desktop option. Windows 8.1 also includes improved Bing integration "to improve the fundamental usability" of Windows, he revealed. Ballmer also talked about how quickly Microsoft's transformation from a software company into a hardware maker with a "rapid release cycle." He said that a rapid release cycle is necessary for Microsoft to transform into a successful hardware maker, focusing on hardware "driven by software." That software, of course, is Windows 8, the main topic of today's keynote. He didn't leave out Windows Phone 8, either, promising that Windows Phone devices are subject to the rapid release cycle plan, as well. Microsoft's Build 2013 conference is going on now - get all the latest news at TechRadar's Build 2013 hub page.